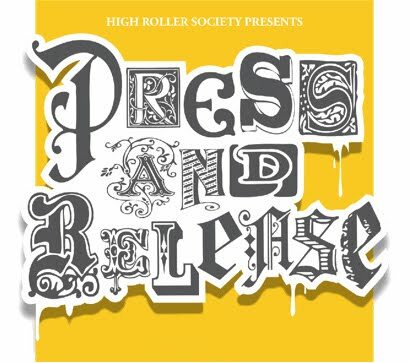 'Press and Release' is the title of the upcoming show at The High Rollers Gallery in East London. The exhibition will feature a collection of hand-made artists prints and the line up of featured artists is looking very impressive so far. Some set to feature in the show include Paul Insect, Dave The Chimp, Fefe Talavera, Kid Acne, Richt, Tek 33, Nylon, Mudwig, Paris, Cept, Busk, Echo, Pinky, Rowdy, Sickboy, Panik, Ludo and Sweet Toof. These are just some of the 59 artists who will have work on show. UPDATE: The show will also feature a screen printing workshop and a linocutting demonstration (dates TBA). Gallery hours: Thu—Sat 1-7 (during exhibitions) or by appointment.